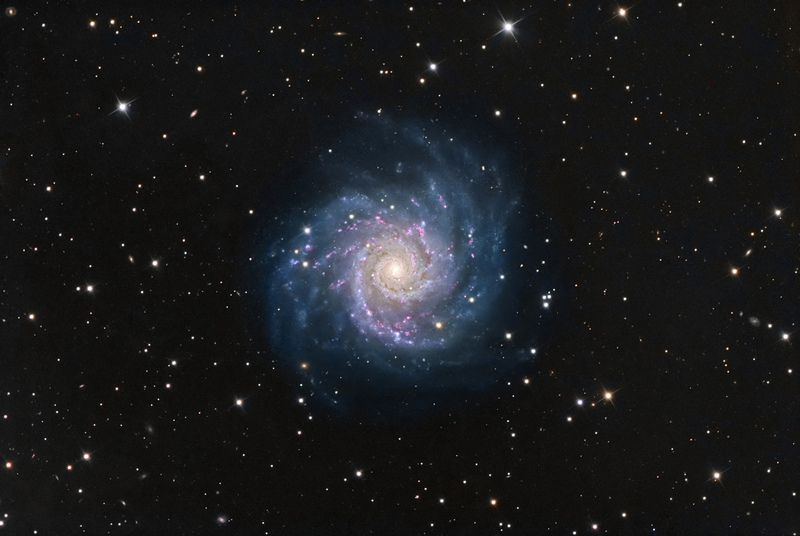 M74 is a bright, magnitude 9.4 face-on spiral galaxy in Pisces that is 32 million light years distant. The abundant HII regions in the spiral arms are evidence of new star formation. 2 additional hours of H-a were added to enhance the HII regions in this latest version. I developed a new method for adding H-a data to galaxies, which I will summarize below. The goal of this method is to colorize the HII regions of a galaxy WITHOUT affecting the colors of stars or the core. Like most Photoshop methods used in astrophotography, it is actually easier to do than to read about. Go through it once and it will become obvious the next time through. If there are any mistakes in my description of the method here, please contact me. Good luck! Use a program such as Registar to register, resize and crop the H-a TIF file to match the master LRGB file. Open the H-a image and process using curves, levels, etc. Copy and paste the H-a image over the LRGB image. Create a clipping layer mask of the H-a layer by creating a Hue/Saturation adjustment layer, clicking colorize, sliding the hue all the way to the right (360 for pure red; 350 or so for some magenta to simulate some H-beta), saturation to 100% and intensity to -50. You will now have this adjustment layer on top of the H-a layer. You will have 3 layers at this point. Right-click on the adjustment layer and select "clipping layer mask". You will now see a downward-pointing arrow in this layer. Change the blending mode of the H-a layer (not the adjustment layer) to saturation. You will see alot of red in the core and arms of the galaxy. We do not want the core or stars affected. The core is bright in the H-a image mostly due to broadband light being picked up by the H-a filter. So, we will "paint-in" only those obvious HII regions with a layer mask. Select the H-a layer and create a "hide all" layer mask from the Layers menu. A black square will appear in the H-a layer. You will see the red H-a color disappear in your image. We will now selectively paint in the red HII regions. But, where to paint, because at this point, you are looking at the master LRGB? We have hidden the red-colorized H-a data. You need a map of where to paint. Repaste the same, processed H-a data as the top layer with the normal blending mode, BUT keep the layer mask that you just created in the colorized H-a layer below active. You will now have 4 layers and the black square in the second layer from the bottom should be active. Make sure that the foreground is set to white (white box in tools palette) and select the paint brush. Size it to the scale of the HII regions. At this point, you will be painting in reddish color with the layer mask, i.e. painting lets the color come through the hide-all mask AND you will be using the B/W H-a image in the top as your guide. Again make sure the top layer is NOT active. Start painting. Avoid obvious stars and much of the core. The HII regions should be obviious. You can either paint continuously or just click repeatedly. To see your progress, just click the "eyeball" on the top B/W H-a image to hide it. You will now see the areas that you painted with additional red saturation. Don’t worry about the color being too strong at this point. Just color all the HII regions that you have or want to accentuate. When you are satisfied, hide or delete the top B/W H-a image and then adjust the opacity of the H-a layer with the layer mask (below the clipping layer mask) to achieve the level of saturation that you want. Again, if you don’t delete the top H-al layer, you will have 4 layers – from bottom to top, the LRGB layer, the H-a layer with its "hide all" layer mask, the hue/saturation clipping layer and the B/W H-a layer that you used to guide your painting into the "hide-all" layer mask. Compress the image into one layer (CTL-SHFT-E) and save into whatever format for posting your image.